The mostly frequented mountain of the two-million-large Bulgarian capital Sofia is attractive during any season with two wildlife reserves, three climatic zones, highest peak Cherni Vruh, varied flora and fauna, curative mineral springs and a rare natural phenomenon - Р° Moraines-bed. 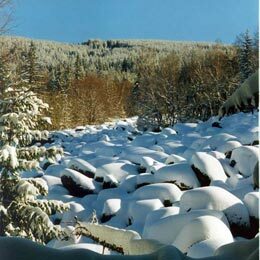 Vitosha is a popular mountain resort for winter holidays and skiing, with modern hotels and ski facilities. In the over-one-century history of the city Vitosha has become a symbol of Sofia, benefiting it with a rare natural advantage shared by few big cities globally. On the peak itself, Cherni Vrah (2,290m) besides the meteorological station and the base of the Mountain Rescue Brigade, there is a tourist station where one can find shelter in bad weather, but regretfully no beds. It is the cradle of hiking tourism in Bulgaria with the date August 27, 1895 considered to be the beginning of the organized tourist movement in the country. Upon the invitation of the renowned writer and democrat Aleko Konstantinov 300 men and women then climbed the peak - something incredible and unbelievable for the time. At a time when nature conservation ideas were a long way from the present understanding some enlightened noblemen took the first step in 1934 by declaring 6600 ha of Vitosha as a National Park, hence Vitosha became the first and bigger nature-protected park on the Balkan Peninsula! Nature fans find the mountain even more seductive with its unique natural phenomenon - the so-called "stone rivers" (moreni) - formed by piles of huge rounded granite stones along many of the river valleys, some reaching up to 2 km in length and 50 m in width. You can take it holidaymaking also with a history tour around Vitosha. The UNESCO-enlisted Boyana Church (1259) offers its visitors exquisite frescos, which are the best of their kind in Europe preserved from early mediaeval times. It was just recently reopened after thorough renovation of the unique frescoes, which have been stopped and re-launched several times for the last 50 years. The 14-century Dragalevtzi Monastery is one of oldest in the local area dating back to the reign of Bulgarian King Ivan Alexander. It has offered shelter also for Bulgarian Apostle Vassil Levski. The Church of Saint George in Bistritsa is located on the place where the main monastery of Sveta Gora was in the past. There are mineral water springs in some villages - Rudartzi, Knyajevo, and Zheleznitza. Even though it is smaller in area than the other high mountains in Bulgaria, Vitosha has a lot of attractive advantages - high and beautiful peaks, thick woods, many tourist sites, sufficient snow fall ensuring stable snow cover, pure air, hundreds of kilometres of well marked tracks, numerous lodging places and restaurants, comparatively well preserved nature, clean potable water, wonderful ski facilities, rich history. Adding to all these closeness to the biggest city, it explains why is this mountain visited and loved so much.